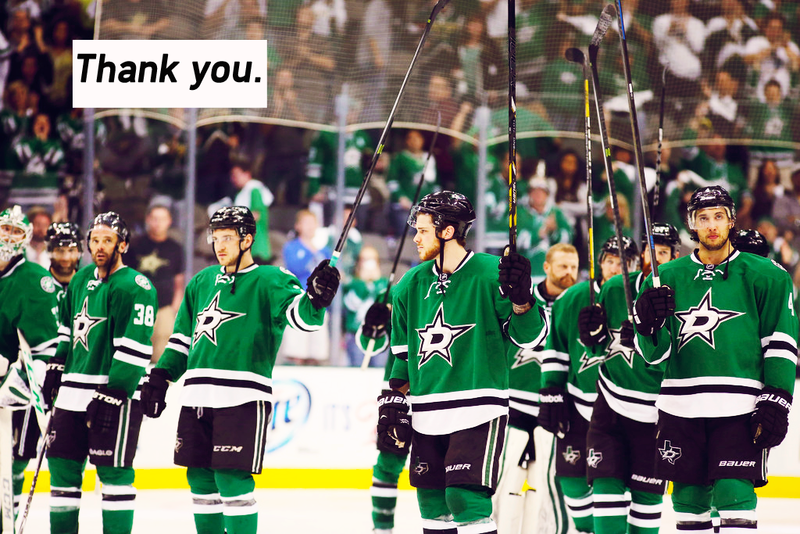 It’s the 4th of July, or as I like to call it, “The Anniversary of Seguin Getting His Independence from Boston.” A lot’s gone on in the 365 days since that important trade, and I think we can all agree that it was a turning point for the Stars franchise. 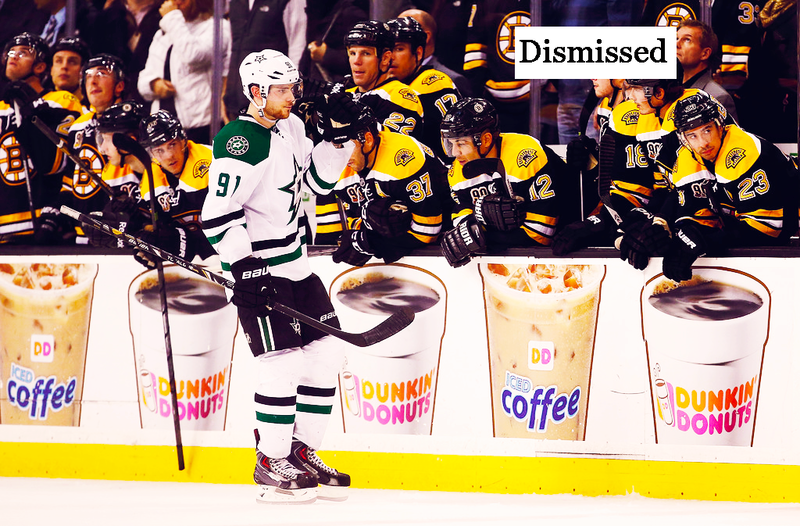 Because Jim Nill worked his magic and stole Tyler Seguin (along with the incredible Rich Peverley) from the Boston Bruins for the price of Loui Eriksson, Reilly Smith, Matt Fraser, and Joe Morrow the Stars suddenly became a new team, a more formidable team. It wasn’t always an easy ride, but the Stars made giant leaps in 2013-14, and it all began with the Tyler Seguin trade. The trade showed the rest of the league that Jim Nill isn’t fooling around: he has a plan, and he’ll do whatever it takes to fulfill that plan. So we missed out on buyout centers Vinny Lecavalier and Danny Briere? Whatevs, Jim Nill went out and traded for TWO right-hand centermen, one of whom has the potential to become elite (spoiler: he did). And suddenly two of the top 10 scorers in the league are on the Dallas Stars. Suddenly the Stars boast a dynamic duo to rival Crosby/Malkin, Getzlaf/Perry, and Kane/Toews and look a whole lot more dangerous. Factor in what Nill did this offseason, bringing in Jason Spezza and Ales Hemsky, and you have a team that went from zero to hero in the span of ONE YEAR. That’s amazing. And it all started with the acquisition of Boston’s supposed problem child: a guy so far gone that it was too late to save him from his party boy ways, an immature kid who was incapable of growing up, the young player whose scoring drought lost the Bruins the Cup. All Jim Nill had to do was take a chance. The Sharks are adding Ice Girls, a move that is really terrible. Read about it here on Sharks blog Fear the Fin. And send your thoughts to the Sharks’ business operations via this page on the Sharks’ website. As a female hockey fan, it concerns me that the Sharks have decided to add Ice Girls at the expense of men and women who are already performing the ice duties perfectly well. This move is deeply objectifying. Give me one good reason why the male ice workers are able to wear the standard parka/baggy pants uniform, yet the female workers have to dress like they’re at the beach to do the exact same job. This move sends a horrible message to fans of all ages that the Sharks organization values superficiality over all else. It’s not too late to change that message: a more positive message could be sent by reverting back to how the ice crew operated before. PLEASE reconsider the decision to add ice girls. No one deserves to be exploited, and I truly believe that the San Jose Sharks can be better than this. This is half tongue-in-cheek and half serious. Because, seriously: is Cody Eakin a second or third-line center? Are you supposed to get emotional over your own Photoshop work? Whatever. I made this, and it still feels relevant. Original post is on my Tumblr here. 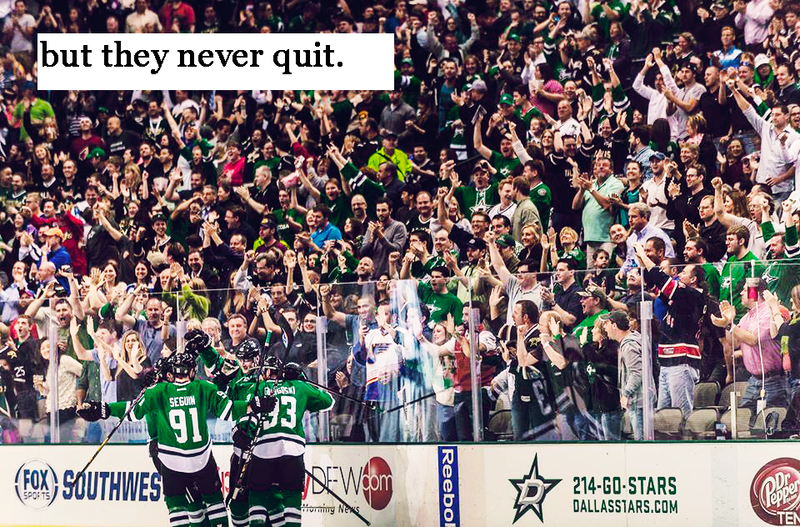 Playoff hockey is finally back in Dallas, and the Stars put on a beautiful show. The American Airlines Center was full and loud and I so wish I could have been there. 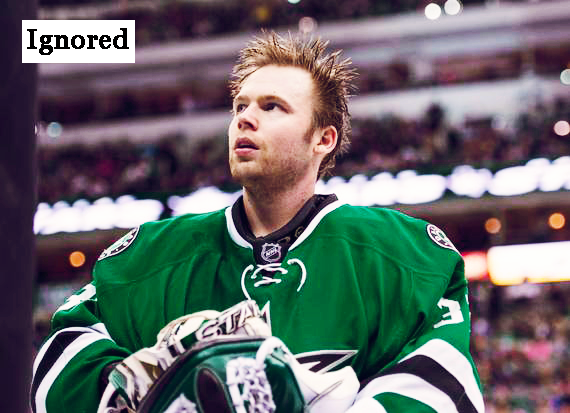 One of those Stars was Kari Lehtonen, whose first playoff victory was a shutout. Val got his first playoff goal and I cried. I love my Russian bae. The only bad part about the night was Stephane Robidas getting injured again. It completely broke my heart. But it was so, so classy of the fans to give him a standing ovation and do a “Robi, Robi!” chant. He is well-loved in Dallas, and we take care of our own. 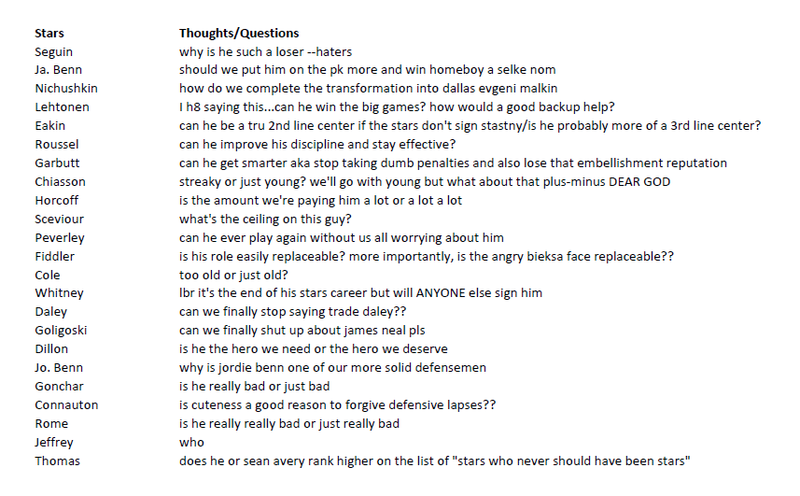 I really, really hope that he’s able to come back again. I’m really struggling to find words to describe Game 3 because it means so much to me. 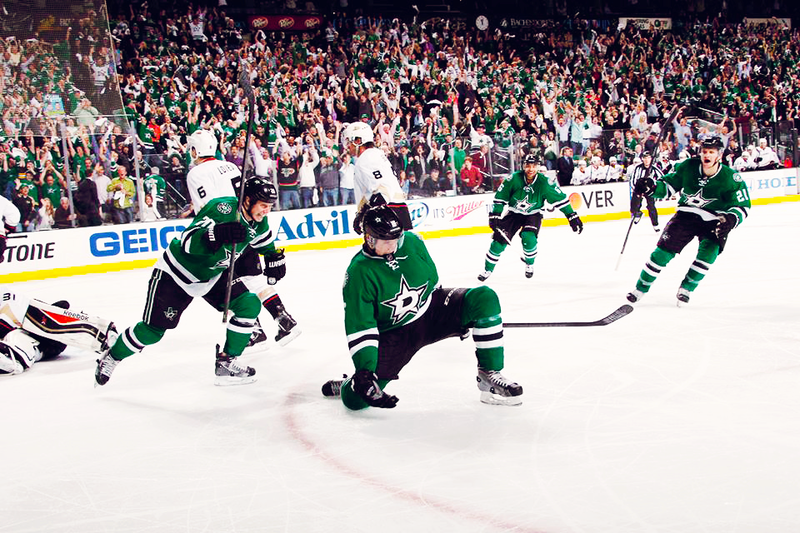 The Stars were amazing to watch, and if they continue to bring it like they did last night they will win this series. 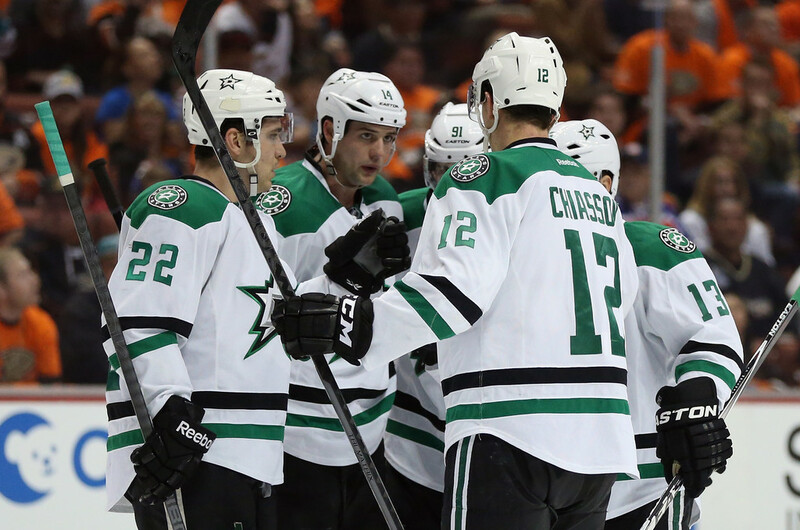 The Ducks are really, really good, but the Stars can match them if they stick to their game. The first half of Game 1 was pretty ugly. 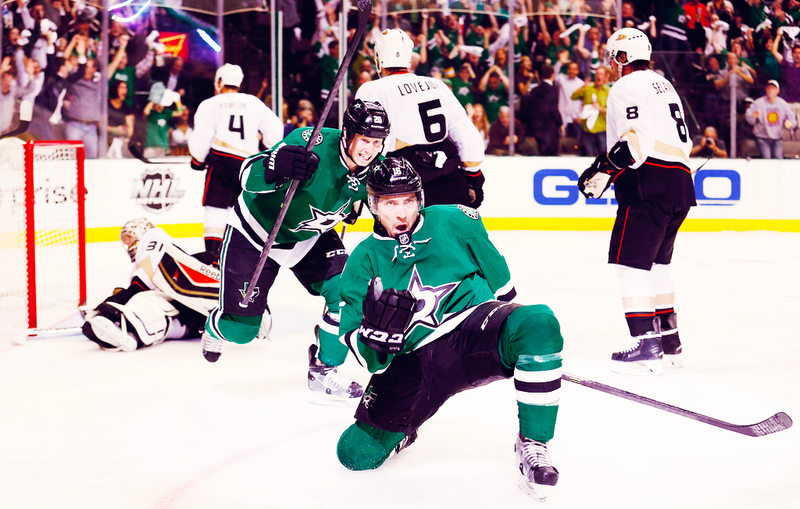 The Stars’ and the fans’ worst nightmares became reality as the guys found themselves in a 4-0 hole. I had suspected the Ducks would come out and overwhelm them and I was unfortunately correct. And who could blame them? A lot of the guys were playing in their first career playoff game and several others hadn’t been in a playoff game in years. In this season, it’s a victory just to be there, but who can blame everyone for wanting more? By the end of the second period, the Stars seemed to get it together. The Stars’ first 5-on-3 goal of the season sparked a change in the team’s play and allowed them to induce a little bit of fear into the dominating Ducks. It’s impressive that they got three goals to make it a one-goal game, especially considering how little experience the team as a whole has. I can’t help but see that as a good sign for the rest of the series. The game played out much like the rescheduled Columbus game from last Wednesday: a flat Stars team comes out, falls behind, figures it out, and attempts a comeback. This team is young and growing pains are inevitable. 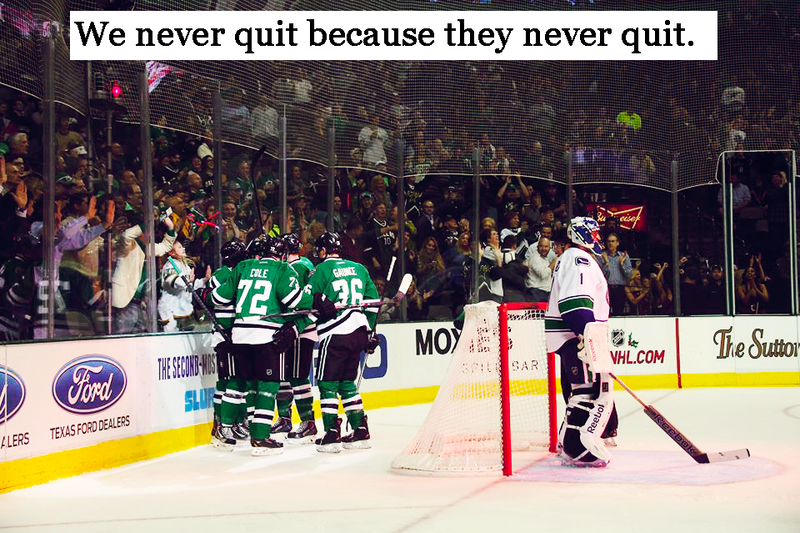 But what’s impressed me this entire season is the Stars’ ability to adapt. I think a lot of this falls on coaching–Lindy Ruff has been phenomenally patient with his team. Even though they came out a little hesitant and scared, by the end they seemed to get a grip. I anxiously await Game 2.